Our group of American teachers who will be in Jyväskylä in the Spring of 2015. 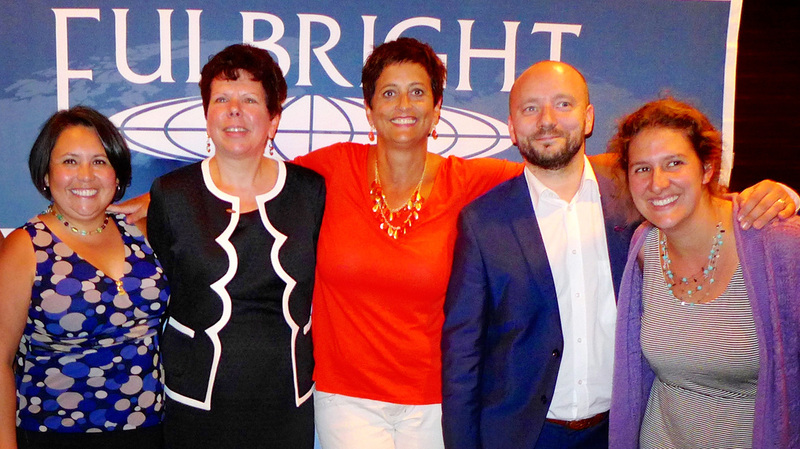 In April 2014, I was awarded a Fulbright Distinguished Award in Teaching Fellowship for the 2014 - 2015 school year. At the end of January, 2015, I traveled to Finland for a 4-month period to conduct research for my Capstone Project: Global Learning: Fostering knowledge, attitudes and skills for global citizenship. I am working in partnership with the Fulbright Center in Finland and my host university, The University of Jyväskylä. In August 2014, I attended the Fulbright Orientation in Washington, D.C., which was a rigorous, exhilarating professional development opportunity to not only prepare for our international experiences, but to continue to build context around our teaching through local and international lenses. Over three days, working with teachers from across the United States and from Finland, Singapore, India, Morocco, and New Zealand was one of the most rewarding professional experiences of my career. I am keeping a blog of my experiences in Finland here. I invite you to read about the Finnish education system through the lens of an American teacher. Download my Fulbright profile here.